Dimensions 28'10" by 37'9" by 9'6"
Power plant 1 1200 hp (895 kW) Pratt and Whitney R-1830-17 Twin Wasp 14-cylinder two-row engine driving a three-blade constant-speed Curtiss propeller. 1424 of all models. 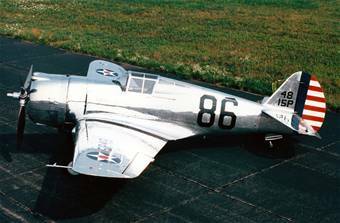 177 P-36A, at least 33 P-36C at Curtiss-Wright Airplanes Division, Buffalo, NY. A small number were assembled overseas, including 20 in Argentina, 30 or 40 in China (CAMCO) and 5 in India (Hindustani Aircraft). The P-36A used a 1050 hp (783 kW) R-1830-13 and lacked the wing guns. The Hawk 75 was an export version using an R-1820 engine and fixed landing gear. These were sold to Argentina, Thailand, and China. The Hawk 75A used the more powerful R-1830 and was sold in large number, 350 reaching France before the capitulation. Although a capable aircraft by the standards of 1940, and a thorn in the side of the Japanese in China before the arrival of the Zero, the P-36 Hawk was obsolete by the time war broke out in the Pacific. In particular, its lack of any kind of supercharger greatly limited its high-altitude performance, and its combat radius was only about 225 miles. Its retractable landing gear were excessively complicated to avoid paying royalties on a more modern design. The design came out of an Army Air Corps competition to design a modern monoplane fighter. The prototype flew on 15 May 1935, but the Air Force awarded the competition to the P-35 Seversky instead. Curtiss replaced the original R-1820 with a more powerful Twin Wasp, demonstrating the prototype in February 1937 and winning a production contract shortly after. France ordered a large number of the Hawk 75A export version, and 350 of these aircraft claimed 311 Luftwaffe victims in the battle of France. The remainder of France's order of 620 went to Britain as the Mohawk. A number of these aircraft were present in the Philippines, Hawaii, and the mainland, and saw some combat, in which they were usually outmatched by the Zero fighter. However, P-36s claimed two enemy aircraft at Pearl Harbor.